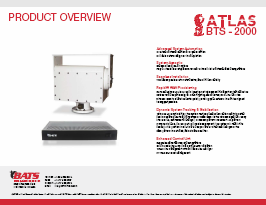 The ATLAS BTS 2000 is a purpose-built microwave stabilization system designed for systems featuring up to 10FT antennas. Ideal for multi-ODU configurations, the ATLAS BTS 2000 represents a flexible solution for operators looking for stabilized microwave line-of-sight, (LoS), communications. The ATLAS BTS 2000 represents a step in the next evolution of BATS’ industry-leading automated tracking and stabilization platform. Positioned for radio/antenna assemblies of up to 10ft, the ATLAS BTS 2000 sets a new standard for performance, simplicity, and reliability. Featuring radio agnostic, technology; organizations can leverage a multitude of available manufacturers to deliver their critical communications in fixed or mobile applications.